SeniorMatch.com was developed in 2001 to help single adults search and find other singles who share a common interest. 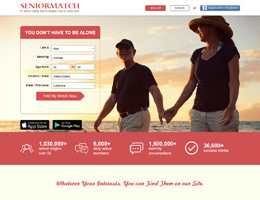 SeniorMatch.com is ranked among the top senior dating sites aimed at linking or generating communication between seniors most preferably over the age of fifty. This online dating site is strictly for senior singles, while not providing room for those under the age of thirty. This is to ensure that membership is only for the elderly singles. Membership at SeniorMatch.com is divided into four different categories offering different payment plans. Despite standard membership being free, you would definitely find great pleasure in going for gold membership either one, three or six months for $29.90, $59.95 and $95.95 respectively. Payment options for SeniorMatch.com is diverse giving you the ability to subscribe using either Mastercard, PayPal, visa credit and American express, or money order, and banker's cheque via postal mail. Profile: This is the first thing you need to set up immediately after registering yourself with SeniorMatch.com which then allows you to edit your profile and add each and every detail you would wish to share with other registered members who share either the same interests or needs as you. Confirmation and verification: After signing up for this online dating site, the next crucial step would be to verify your identity so as to prove to others that you are a real member of this site. By doing so, you will receive badges from other members that would confirm your age, gender, education, work among many more. News feed and senior forum: These are two different features of SeniorMatch.com that allow you to stay up to date with the latest trending news and stories on this site. You can as well post your views and opinions at the senior forums tab and keep the conversation going. Search engines: This feature allows you to perform either an advanced search or quick search. The advanced search option gives you the ability to search for specific members with greater specification to personality and style. On the other hand, the quick search enables you to perform general searches of members with distinctions among broader categories. Looking for a date past the age of fifty is an opportunity to experience new things that are definitely to look out for when you register with SeniorMatch.com that you cannot access within your current environment. Each and every new friend does not necessarily have to be your lover; you can make great friends from SeniorMatch.com in such a short span of time. This is the greatest advantage that comes out of dating in your 50s. Mature relationships only come by after you are mature enough and SeniorMatch.com being destined for singles that are over the age of fifty is a sure sign of mature dating. For starters, people can tend to be conclusive and judgmental just by having a look at your profile picture or profile details. This in some way makes it much harder and complicated to find the right mature person that you are looking for. One can be very anxious especially when they are just about to see the one person he or she has been communicating with online as you would not be quite sure of what to expect. Finally, SeniorMatch.com is somehow made to accommodate only the wealthy who are capable of paying for the gold membership. There is no other way of making communication simpler than doing so through the introduction of a mobile app with different versions both for android and iPhone. The mobile app allows you to get access to your account and millions of other registered members by the touch of your fingers. This mobile app has the advanced feature of custom notifications allowing you to get instant notifications whenever there is an activity associated with your account. For more than a decade and a half, SeniorMatch.com has turned out to be the best online dating site for all the senior individuals over the age of fifty and are looking forward to starting a new relationship. With the time duration it has been in existence, it is highly recommend for you to give it a try. Of course only if you are over the age of thirty.